Looking at the graphs below, spring has one of the highest peaks of activity as many people list their home then; however, there are those who don't realise how much time it takes to get their home ready and leave it until later in the year. So, be the early bird who catches the worm as buyers are keen to buy after a lack of listings to choose from in winter. When the property market starts to heat up again in spring, eager buyers are ready and waiting to compete for new listings. The majority of new property listings tend to come onto the market in February and March, and then again in October and November. That equates to 40% of all new listings in a year coming on to the market within those 4 months alone! 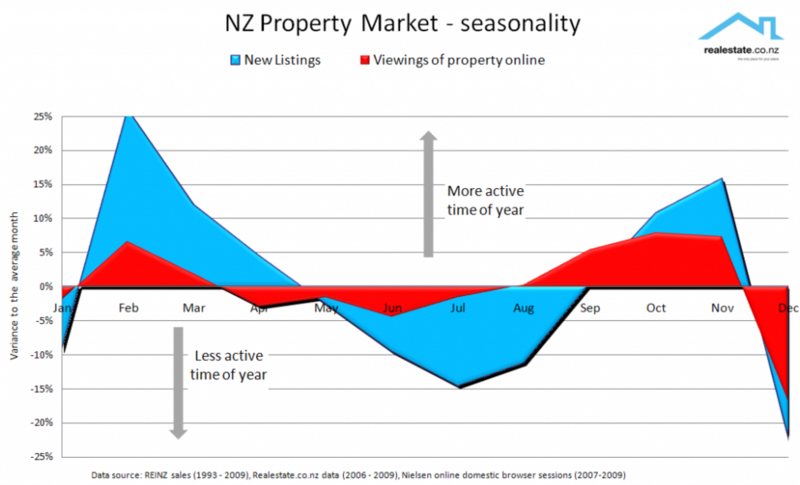 The winter months of June, July and August show the lowest level of new listings coming on to the market. Barely 20% of the annual total of all new listings hit the market during the 3 months of winter. March is the most active month of the year, with January being the least active. Taking a typical year and a total sales of, say, 8,000 in March that's 258 sales per day compared to the winter months averaging around 216 sales per day. Keep in mind, though, that buyers aren’t quite as fussy about what season they buy in. They’re looking for what they want when they’re able to — and that doesn’t necessarily fit in to any seasonality.